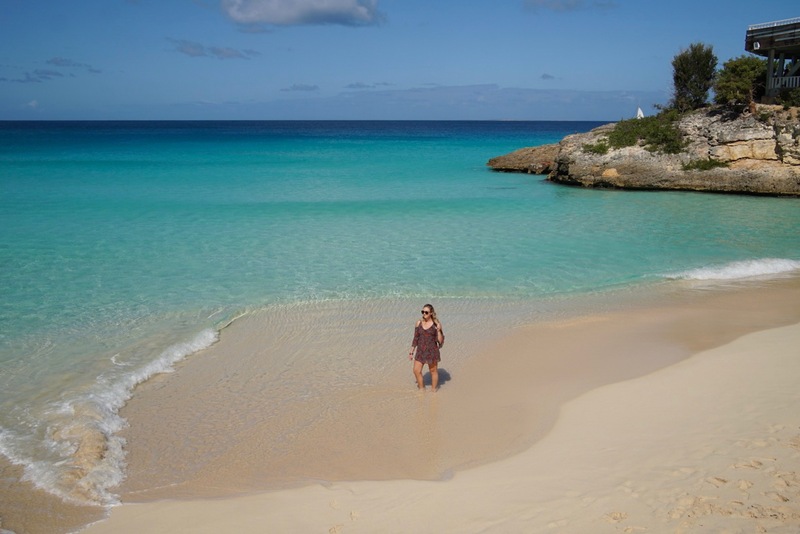 Luminious Anguilla Seas & Carimar Beach Club - Where to, Peanut? I booked my stay at Carimar Beach Club just two weeks before Hurricane Irma struck Anguilla as a Category 5. It was radio silence for nearly a month post-Irma. A small country, Anguilla did not make the news at all. Without power and internet to the island, social media was blacked out as well. Then, in early October, “We are currently housing the United Nations,” was the first line in an email from Carimar. The trip was on, to a country where at least our hotel was still standing. Just shy of 5 months post-Irma, we touched down in St. Maarten. Driving to the dock to meet our ferry across the Anguilla was a unsettling experience. Megayachts upturned in the harbor, and more buildings seemed to be missing roofs than possessed them. We cleared customs in a tent. We zipped across the 9 mile channel to Anguilla in a speedboat operated by GB Ferries, and picked up a rental car with pockmarks from debris that hit it during the storm. What we found on Anguilla, though, was the strongest show of what hard work paired with resilient people can bring. In a word, it was a different world in terms of its recovery. Carimar Beach Club from unit 201 balcony. This little friend visited us daily at Carimar! We arrived at Carimar Beach Club right at sunset, after we puttered our adorably small rental car across the island, reggae riffing through the stereo. Carimar is an all-suite style property that allows guests to feel right at home with a full kitchen and living room in every room. Styled in colorful and tropical motifs, the mood in our villa was bright and inviting. The spacious interior gave way to a large balcony overlooking the sand and sea of Mead’s Bay (which ended up being the setting for most of our meals on the island). 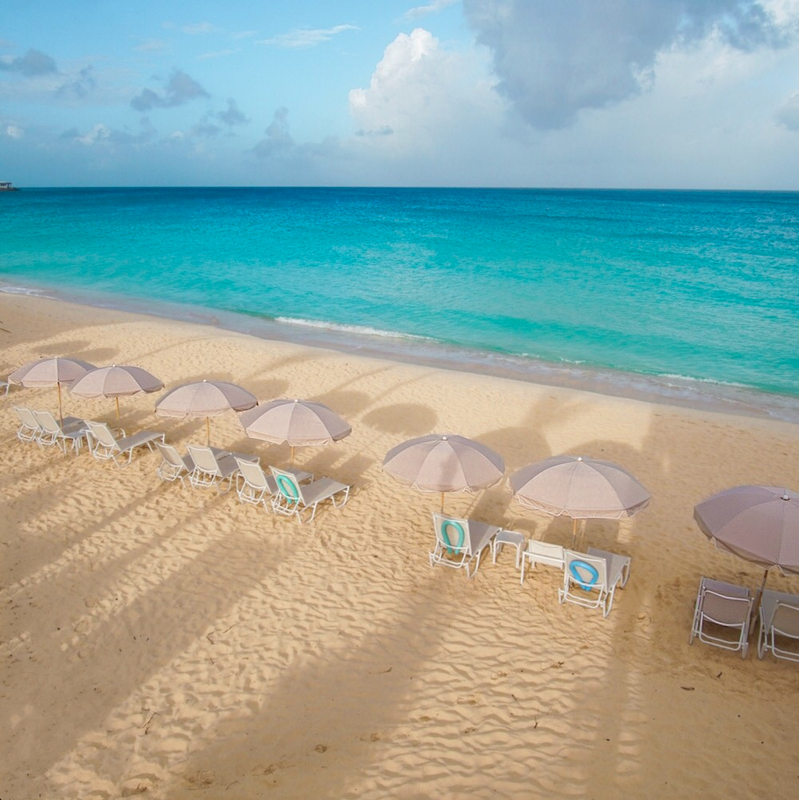 It was not until we woke up the first morning that I could truly appreciate how special the beaches of Anguilla are. It is no use describing them: the photos are worth a thousand words. 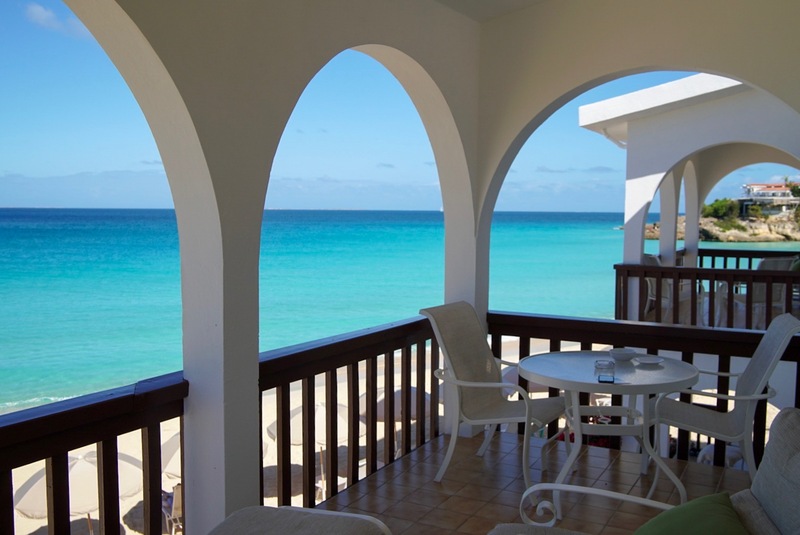 I stepped out onto our gorgeous oceanfront balcony and stood in awe at the bluest waters I have seen to date. Carimar Beach Club: massive balconies. 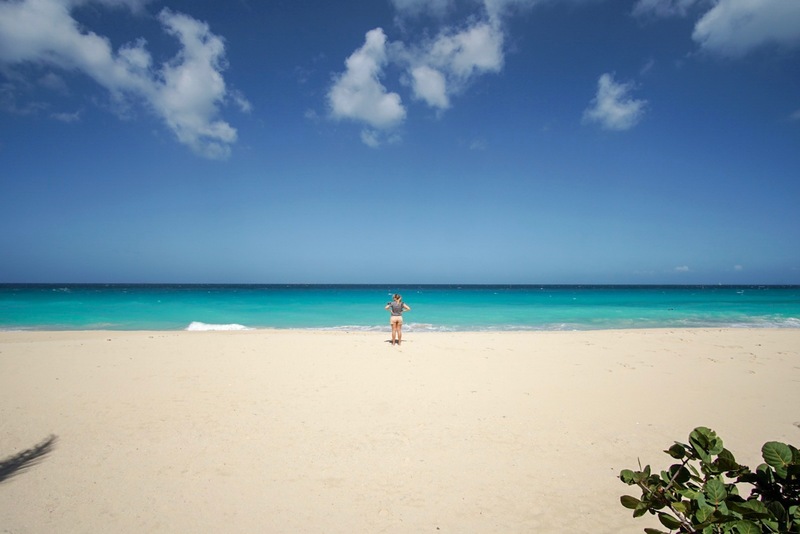 Renting a car on Anguilla is something I cannot recommend highly enough. 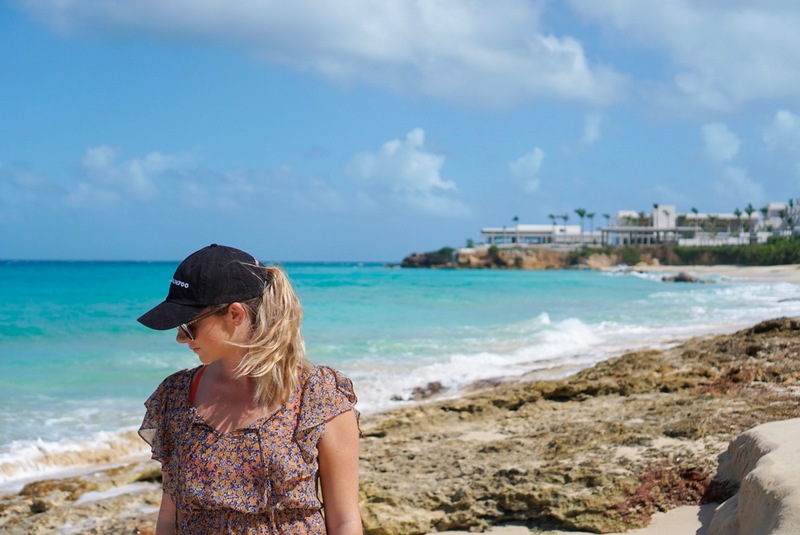 We rented via Andy’s Car Rentals, and our little car was the key to so many of our adventures on Anguilla! Beach hopping was my favorite activity, and discovering the majority of the 33 spectacular beaches in the country remains a highlight of the week we spent there. I chatted with a local guy and he told me, “The beaches of Anguilla will ruin you for the beaches anywhere else in the world. You’ll be forced to keep coming back because nothing will compare.” My favorites? All on the west end. Maunday’s Bay, Shoal Bay West, and Mead’s Bay. Indescribable. Maunday’s Bay. The Cap Juluca was closed for renovation at this time (Feb 2018). Dining on Anguilla was of unexpectedly gourmet quality. Though budgeting for meals out was something I didn’t put enough care towards (expect $20 lunch entrees, $30+ dinner entrees, $15 cocktails), every meal that we ate out was truly a special experience. On the epicurean side, Julian’s, located at the fabulously ostentatious Quintessence Hotel was a treat, with an ambiance sopped in romance, up to and not limited to a red rose laid at the table on Valentine’s Day. The Straw Hat was a wonderful beachside restaurant with quite possibly the liveliest and most personable staff we encountered — also, my first and only pleasurable experience eating goat. 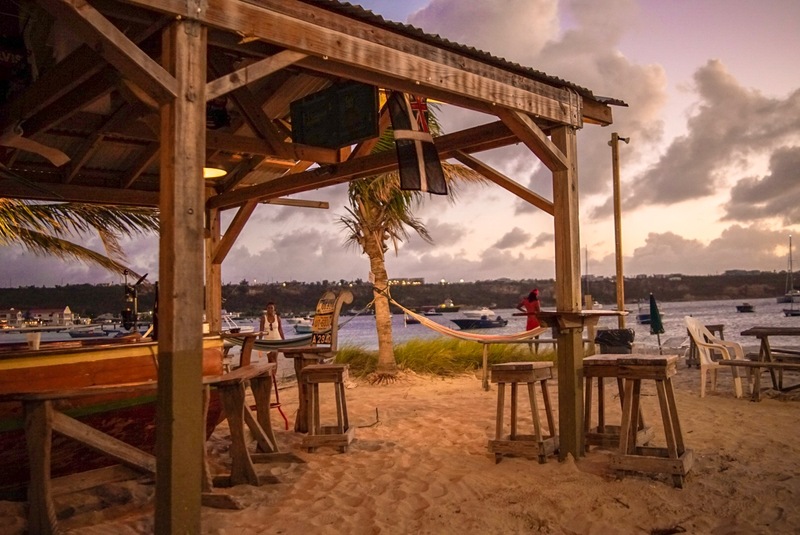 For nightlife, admittedly we hit Anguilla at a low point in terms of tourism, but Elvis’ Beach Bar was a quite lively bar made from a boat with the best sunsets and the best rum punch to boot. 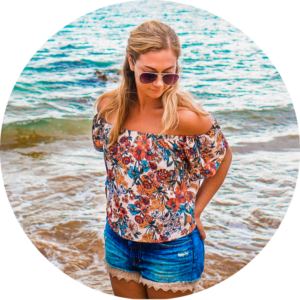 My other favorites included Sunshine Shack for a beachside barbecue with reggae vibes, and Tattoria Tramonto for a wonderful Italian meal on one of the most pristine beaches on the island. Elvis’ Beach Bar, Sandy Ground. 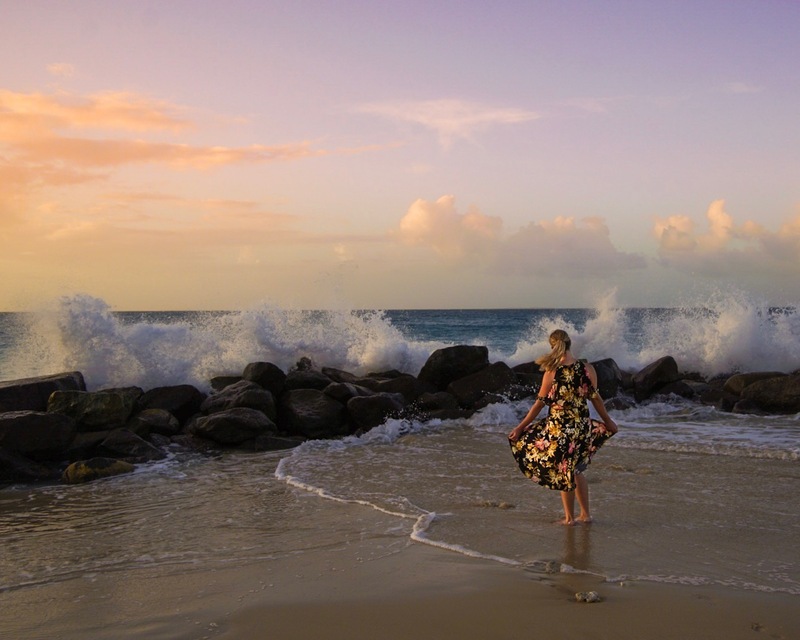 As alluded to, Anguilla fashions itself as an exclusive destination, and for good reason. Even being from an expensive corner of the world (SF Bay Area), I truly did feel the sticker shock of eating out on Anguilla. So, for transparency’s sake, I will tell you that for every meal we ate out, we ate two in. It hardly felt like a tradeoff, though, given our gorgeous oceanfront view at Carimar. 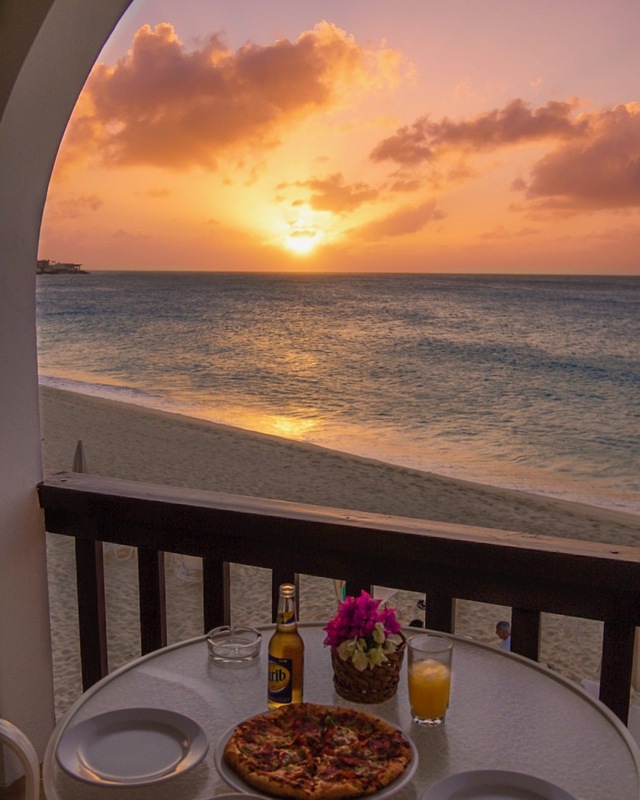 In fact, one of our most cherished meals was actually a DiGiorno pizza we baked in our room and ate at sunset with a Carib beer. All about location! 100% serious about the DiGiorno on my balcony. Undeniably, the sentiment that stuck with me the most about Anguilla was of warmth and of strength. 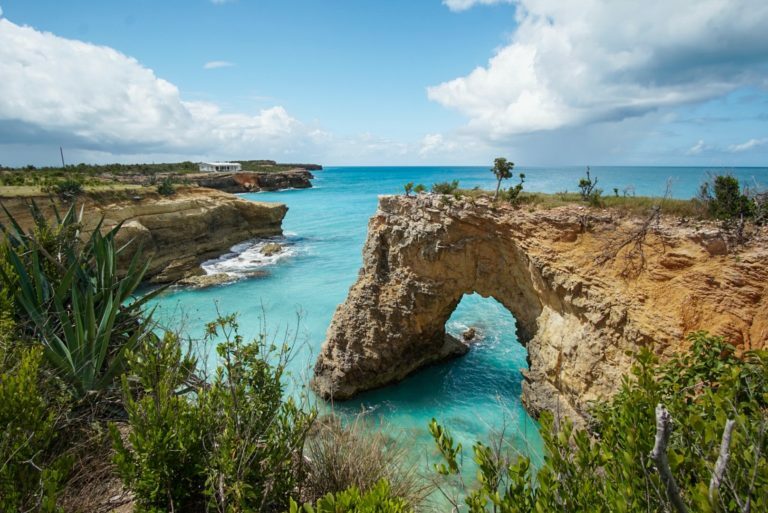 The people who call Anguilla home are undeniably proud of their island, and lifted it from a truly heart-wrenching place of destruction in record time. Each and every person I met welcomed me with all of their heart. 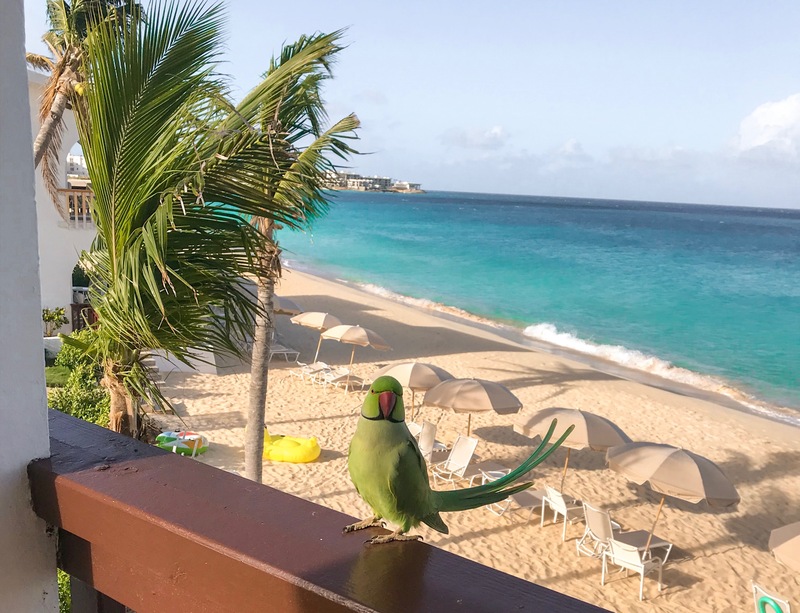 Though I experienced Anguilla in an in-between place, with many hotels closed for renovations, it is a place I knew I truly would return to before I left. Barnes Bay, Anguilla. The Four Seasons was closed at this time (Feb 2018). Gorgeous photos, Nicole! It looks well worth the splurge, and that birdie is just beautiful.